The video tributes above were lovingly created by Ginger De Los Rios, a dedicated Hexum fan and mega-talented video editor in Brooklyn, New York, who has contributed much of the video work you see on this site. "I first came across Jon-Erik one summer evening in 1982, as I was leafing through the TV guide's line-up of the new Fall shows. 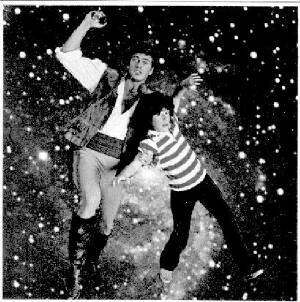 As I recall, he was dressed up in his pirate outfit, omni in hand, falling through space with a confused looking Meeno Peluce. Something about his eyes grabbed me, but I didn't think much of it at the time. As luck would have it, however, I happened to be flipping stations at the moment the premiere of Voyagers began to air, and I remembered thinking -- 'Oh, it's that guy from the TV Guide' -- and there he was --- with the aw shucks, unassuming manner, striking eyes and oddly deep voice. He stood out from the David Hasselhoffs and the Matt Houstons. He was real. "Whenever I would think about it, I would tune into Voyagers. The premise was engaging enough, the episodes relatively entertaining, but it was Jon-Erik and his chemistry with Meeno that made the show. 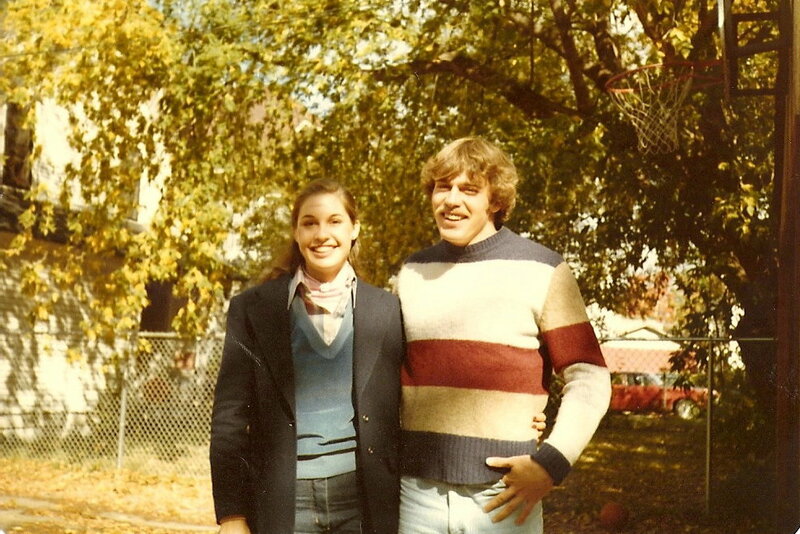 "The demands of my college life and part-time jobs became more than a mere distraction for me, so Jon-Erik and his time travel adventures slipped away from my attention for quite a while. I missed Male Model in 1983 -- as well as the Bear and Cover Up. All that was there to keep him in my head was his barechested poster, which occupied the racks of every mall's teenybopper gift shop, sitting there beside Cheryl Tiegs and Prince. "And then, one night in October 1984, I heard his name again. I was in my car on my way to work; the radio had been playing Chakha Khan's 'I Feel for You' and Corey Hart's 'I Wear My Sunglasses at Night', when the DJ came on and said that actor Jon-Erik Hexum was in critical condition after an on-set gun accident the week before. I instantly remembered those haunting eyes I'd spied in TV Guide and the pin-up poster. I remembered the sound of the deep voice and the face of the self-deprecating hunk I'd seen on TV. I felt inexplicably saddened, as if I'd lost a friend. A friend I'd never actually met. Later that night, the DJ said that Jon-Erik had been declared brain dead. "In the weeks that followed, I began to read about this person, and his life. I realized I liked his way of approaching his goals, of going after what he wanted, seemingly without stepping on the little people to get ahead. I realized it was that passion and intensity of being that had radiated out of those piercing blue eyes when he'd first grabbed my attention. He possessed a certain purposefulness of existence, and it drew me in, giving me direction and drive. And for that, I'll always be grateful. Jon-Erik was just doing his own thing. Nothing particularly altruistic or saintly. Not like Mother Theresa or Nelson Mandela. Yet somehow his doing his own thing made me want to do my own thing -- and do it well. And what could be nobler than that?" "I first read about the Jon-Erik Hexum Fan club about two years ago in an entertainment magazine. And only two days ago I happened upon your website at my local library. Thank-you for keeping the memory of Mr. Hexum alive. It means so much to me that I would like to support this club and become a member. 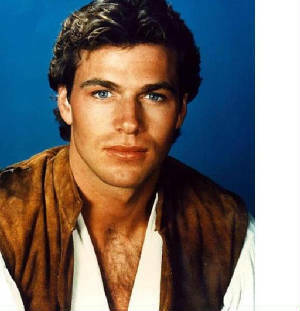 "I saw Jon-Erik Hexum for the first time when I was 11 years old. My brother dragged me out of my room to watch the premiere episode of Voyagers!, and I watched every episode after that one religiously. I was twelve and thirteen years old by the time he was in Male Model and Cover Up, and although I was still a big fan of his, I felt it was too immature to be crazy about some guy on TV. "One of the strongest recollections that I have about the week following his accident was my failure to realize how serious his injury had been. One of my best friends said, "Oh, he won't die. The good guys always live." This logic made perfect sense to us eighth graders. Unfortunately, Jon-Erik died the next day and I felt my heart literally break when I heard the news. "I believe that Jon-Erik's death zapped a lot of people (like me) into reality. Granted I was young, but I gained a deeper understanding of how precious life is. "Next month I turn twenty-six years old, the same age Jon-Erik was when he died. I have always kept a small picture of him in the back of my wallet, and when friends ask who he is, I always tell his story. One of my greatest fears was that Jon-Erik would be forgotten and thanks to you he is able to live on a little longer. 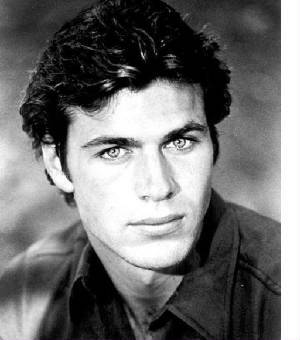 "Thank-you again for your dedication of time to Jon-Erik Hexum and please send me any information that you have obtained. Good luck on the biography and much continued success with the club." "It had been one of 'those days' right from the start. Hey, with me, I have them quite a lot. It was a rainy day in Baltimore, MD. I had gotten on a train with another girl, both aspiring models, looking for a break in the Big Apple. As we arrived there, it was still coming down, and we had quite a few places to go. After a long, disappointing day, we got to the last stop. As we sat there, I remember thinking how I'd just like to go home and have a good cry. Never before had I been rejected so many times by so many people. It seemed as though if they found one good thing about my appearance, they found about 15 bad ones. Finally, a man came out, middle-aged, and interviewed us. Well, he was interested in me coming back to NY, but just like Jon-Erik's movie, there were other 'Things' he expected a model to do. Being a proper Catholic girl with good morals, I turned these offers down, hey, I was 19! I had other things I could do. "While standing there accessing my thoughts, he pointed to a man behind a desk. He asked me and my friend if we knew who he was. 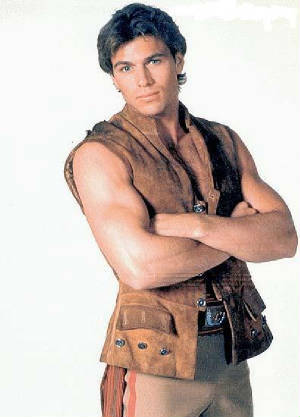 I was not up with the show, Voyagers!, but I had heard and seen Jon-Erik before on commercials and in magazines. Boom! I knew who he was. Excitedly, I asked the man if we could meet him. Jon-Erik approached us, and I felt weak in the knees. Yeah, I was dating a pretty cute guy in Maryland, but WOW! I almost forgot about him, at least for a moment, anyway. "As you can see, I still treasure that picture only because of the autograph on the other side. I had many of those pictures, but that's the only one I've managed to keep all these many years (see attached). "If only he knew how in just a few moments he had turned a miserable girl's day into a wonderful, beautiful memory. Like the rain, he showered me with compliments, and wished me luck in my modeling career. And although I never again tried to make it in NY, I did very well, as I continue to do locally, here in Maryland with modeling, and he remains in my heart. I continue to wish that maybe some day a male model or someone in my walk of life will come along and be all the lovely things Jon-Erik was. "Those of us who treasure special memories of a meeting with Jon-Erik will be forever saddened by such a tragic turn of events leading to his death. I heard many things about it since then, but I chose to believe that God needed a special angel in heaven. One who was good to others, giving of heart and soul, beautiful, perfect and with a sense of humor only matched by his gorgeous blue eyes. So sadly I ponder, maybe the good really do die young, and if so, Jon-Erik was just that." (attached copy of a Hexum autograph: "To Andrea! Great Meetin you. Love your picture. Wish you the Very Best of Luck. 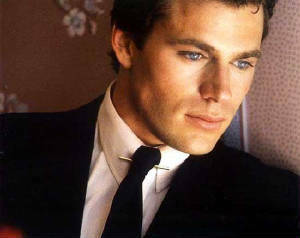 Love Jon-Erik Hexum.") -- ed. "I did meet Jon-Erik once, only too briefly, at Universal, on the set of Voyagers!, and then I made the foolish mistake of waiting too long for the next one. I was planning to visit him again on the set of Cover Up by mid-October, 1984. "I'm afraid there's not much to tell about my single meeting with Jon-Erik. It was sometime in mid-January, 1983, and the episode they were filming was almost certainly 'Barriers of Sound.' I had a late lunch at the studio commissary with Louis Blaine from publicity (and admired Jon-Erik's big, beautiful picture on the wall as we ate). Then I spent a couple of hours in administration in the MCA 'Black Tower', and almost as an afterthought (I can't believe it myself, now! ), I asked if I could make a quick visit to the set of Voyagers!. It was late afternoon already and they were preparing to call it a wrap for the day. Meeno had long since departed (he was only permitted to work something like three hours a day) and Jon-Erik, in his Voyager costume, was talking to several other visitors. Blaine's secretary, Miriam, introduced us,and we shook hands, long and hard. Jon-Erik looked deep into my eyes and asked me: 'Haven't we met before?' 'Not in this lifetime,' was my reply. "I told him I used to be a syndicated movie and TV columnist, and that at this time I had several treatments for screenplays in circulation, and naturally how much I enjoyed the show and his performance; he told me to come back and visit anytime." "I first discovered JE in the fall of 1982 -- like most people did -- in 'Voyagers'. Like the saying goes, 'just one look, that's all it took!' One could easily see he was a diamond in the rough. "To reciprocate for his kindness, I sent him an FBI Academy shirt (usually associated with agents in training) and from that moment on I was to become accustomed to finding notes and postcards in my mailbox from JE. (These notes were always written on the back of pages torn out of scripts! And in his own fashion, he would write his name and address big as day across the back of the envelopes!) He would let me know what talk shows and potential projects he was involved with, and I'd let him know what cases I was working with. "In Feb. 1983, late one evening, I received a phone call from JE -- at the sound of that voice, yes, my knees went a bit weak! He thanked me for all the 'great' letters I had sent him, and for the next 25 minutes we spoke mainly (much to my surprise) about me. He was genuinely interested in my 'career' at the FBI. There were moments when I DID feel like I was having a conversation with Phineas Bogg! He was charming, witty, easy to talk to, and he actually made my work seem more important and glamorous than his was. As he became more popular and busy trying to make his mark, the mail became less frequent, but he always made the effort to let me know where he would turn up next. His extra efforts always touched me, as well as impressed me. I just couldn't imagine ay other 'star' being this considerate. "The following year in April 1984, once again out of the blue, 'my hero' called me. This time we spoke more of what was happening in his life. He was pleased with the 'possibility of a new series.' 'The plot is kinda shaky, but the character has real possibilities.' (This man had a knack for throwing a curve ball. In the middle of a conversation, he would suddenly ask, 'Hey, do you have a boyfriend? To which I replied, 'Yeah, do you?') We spoke of the possibilitiy of finally meeting, as I had invited him to come see me work and take the VIP tour, and he tought it might be possible on his next trip east to pop into Washington DC. "The last letter I received was in late Sept. 1984 -- asking me what I thought of Cover Up. The last letter I wrote was in response to that. Unfortunately, I'll never know if he even got a chance to read it. I like to think he did. I like to think I made him laugh, just as he made me smile. Most of all, I like to think we would have finally met face to face, and I would have gotten a big bear hug!" "Jon-Erik Hexum has been gone a long time. His memory continues in the legions of fans that he had and he will forever be remembered to future generations of fans by the films and television shows he made. Your biography and your work with his fan club continue to keep his memory alive for all of us. You have been an outstanding spokesman and I know Jon-Erik would be proud to have had you as his friend. I know he smiles from above at the work you do to keep his memory alive. "Several years ago I met a lady who met Jon-Erik while she was working on the Queen Mary ship in Long Beach. Voyagers! was filming an episode on the QM and Helen was workring that day. She found Jon-Erik to be quite personable and extremely funny. She tells me he had a natural beauty and that he was quite a flirt (with men & women). During breaks in the filming, he frequently visited with her and talked a lot about the ship and the show. "Helen had her picture taken with him and he gave her an autographed napkin. She treasures both and has promised to give them to me the next time she runs across them and we meet. She's a wonderful lady who happens to be 75 years young." "As I look across the room, I see a picture of Jon; his eyes are staring a never-ending stare. They seem to be crying out of death. Sometimes I wonder if dead people are really dead. 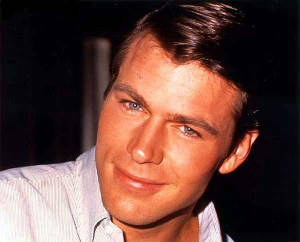 My father died about five years ago, and I expected him to come back, and he did -- through the eyes of Jon-Erik Hexum. "For a while I had the ideal father, that every teenage girl wants, but when he died I went crazy; I couldn't believe that I lost my father twice. "Since then I have gotten over the pain, but sometimes when things are quiet or even hectic, I can feel his hand on my shoulder, telling me everything is going to be fine. "Sometimes I kid myself about admiring a dead man. I say he's dead, and that's all there is to it. But I can't believe that. I love Jon, and he'll never leave my heart." 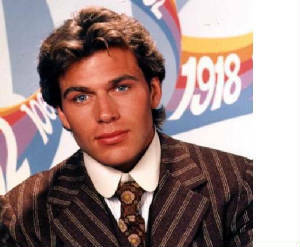 Twenty-three years ago today I suffered a devastating loss when actor Jon-Erik Hexum accidentally shot himself in the head with a prop gun while on the set of his TV series, Cover Up. After failing to recover from the brain trauma, he was declared dead six days later, his organs donated to those in need. That was a really rough week for me. 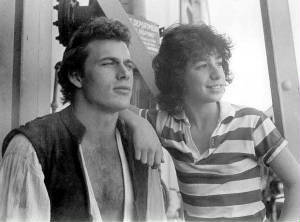 I was 16, studying to become an actress, and had been following Jon-Erik's career since his starring role on Voyagers!, one of my favourite shows, back in 1982. I took his death very hard, because I sorta knew Jon-Erik. While he was working on Voyagers! I wrote him a fan letter, just gushing about him and the show. He wrote me back a few weeks later and included some personal photos of himself on the set. Not publicity shots but candid pics of him and his co-star Meeno Peluce goofing around on set. I wrote him back to thank him, and told him I was studying to become an actress, and he wrote me back again, gave some career advice and even more photos of himself and Meeno (I think I may still have an autograhed picture of him somewhere. I should try to find it.). Anyway, as the months passed and Voyagers! wrapped production, Jon-Erik and I continued to write to each other, right up to the month he passed away. I found out about the accident on Entertainment Tonight and was absolutely sick with worry, praying that he'd recover. The day his parents pulled the plug I went into a deep, near suicidal depression. Jon-Erik Hexum was the kindest, most thoughtful and giving actor I had ever encountered up to that point. I'd hoped that he and I would work together -- or at the very least, meet -- someday. So genuine, caring and compassionate, he revealed many private things to me in his writings, and I will never forget how much he trusted me, a 16 year old nobody from Canada, with his secrets. I still think about Jon-Erik from time to time, and wonder what he'd be doing now, if that prop gun hadn't blown a hole in his temple.